In today’s environment, higher education institutions have to face a wide range of challenges. Besides the increasing digitalisation of teaching and management processes, also extensive contingency plans and stricter safety regulations may exemplify this context. Within these circumstances, the proper and quickest possible redirection of significant information is a key element to cope with these requirements. By means of MobiCall internal and external first aid stations are alerted and evacuations are immediately initiated. Crisis teams and conferences can be called up at the touch of a button according to the situation. A further advantage of this solution is that through a unique info hotline, students, staff members, media and the public are provided with the latest information. 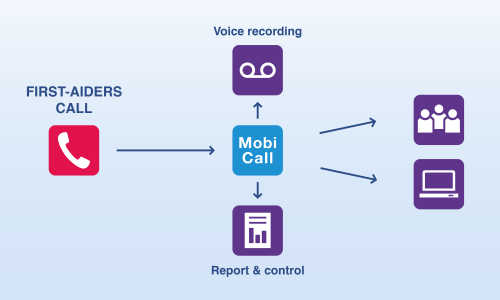 MobiCall allows to create a large-scale networking among systems, devices, sensors and the responsible staff, in order to directly transfer critical faults and important threshold values. 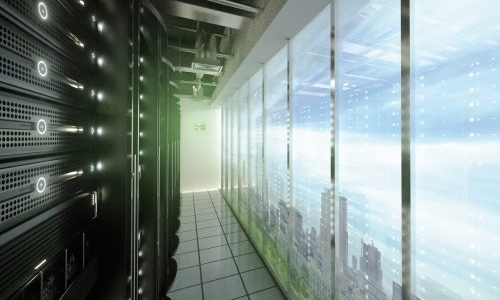 As a result, buildings are safeguarded while preventing damages to the technical infrastructure. The system supports such processes acting as a central alarm and information platform. MobiCall provides a better protection for your students and staff members, as well as a quick reactivity to technical and operational alarms; thus allowing to avoid any kind of faults and to improve public safety. 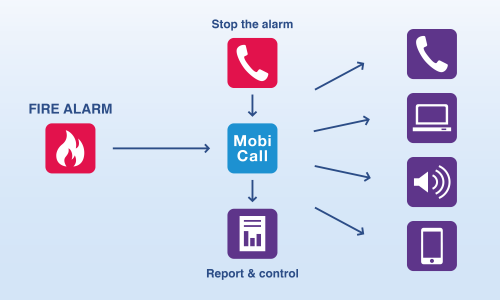 MobiCall provides a better protection for your students and staff members, as well as a quick reactivity to technical and operational alarms; thus allowing to avoid any kind of faults or system breakdowns and to improve public safety. The system provides a time- and calendar-dependent information distribution, which enables a flexible mapping of duty rosters. The information transfer can occur on a skill-based and prioritised, but also on a simultaneous or sequential way, depending on the configuration. 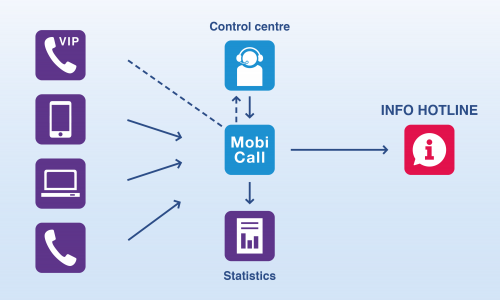 MobiCall also supports internal watchdog monitoring, automatic backups as well as reporting and statistics features. Starting from the current version, MobiCall supports Low-Power Wide-Area Network based protocols, such as LoRa, SigFox or NB-IoT. Thanks to these technologies it is possible to cheaply and quickly integrate any sensor type. A major advantage of this technology is that no GSM, WiFi or Ethernet infrastructure is necessary to let the sensors run. Due to the battery-operated system, no connection to the mains is needed. 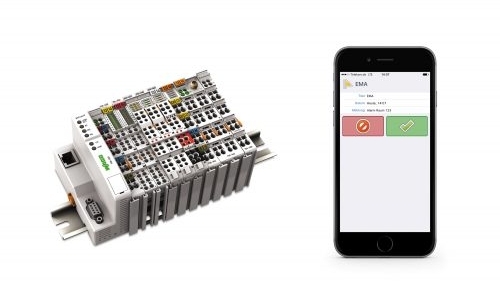 So, allocated emergency buttons, utility meters, or temperature and level sensors can among others simply be connected to a central MobiCall device. In emergency situations like fire alarms, crisis or disaster alerts an immediate mass alerting is required. 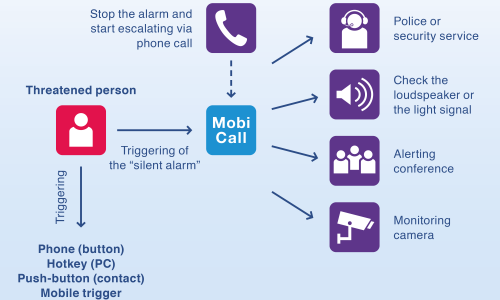 With MobiCall the existing infrastructure can be used so that telephones and computers in use are available to transmit an audible or visible alarm signalling. IP-loudspeakers or central PA systems can be connected in order to play back the proper announcement (e.g. in corridor areas). A further major aspect is the rapid assistance in case of health emergencies. The system can be employed for first aiders’ emergency calls, taking into account the rules and regulations of the employers’ liability insurance association. 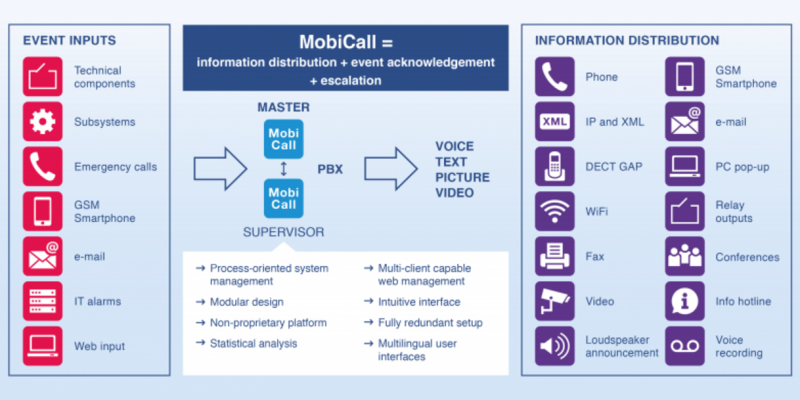 MobiCall can be operated as a central Physical Security Information Management (PSIM) platform. Local systems, such as burglary control panels, access controls, fire alarm systems, PA systems, video surveillance systems, paging stations, individual work stations, intercom or central building control systems can be recorded and displayed on a central customised user interface. Thanks to all the gathered information, the user is able to get a comprehensive overview of the situation. 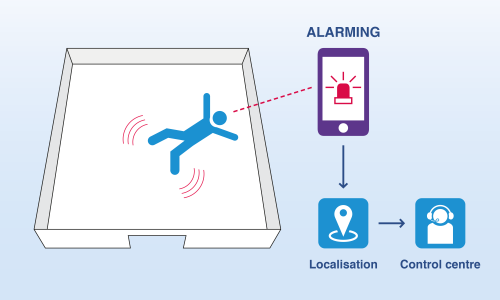 Depending on the circumstances, different scenarios can be put activated, monitored and managed both manually and automatically. 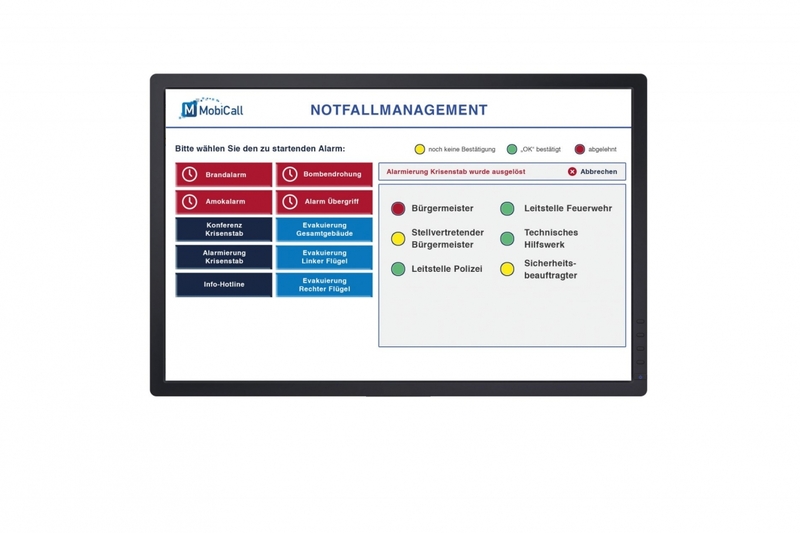 MobiCall, with its variety of interfaces, allows a real time monitoring of all subsystems, such as process control and display systems, as well as building management and ICT components. When faults or critical thresholds occur, the detailed alarm information and process data are automatically conveyed through the cross-platform to a defined group of people. The integrated task management is a major advantage of this solution, ensuring faults classification and tracking. The whole process, starting from the alarm trigger up to the troubleshooting including the usual SLA times, can be monitored and displayed.